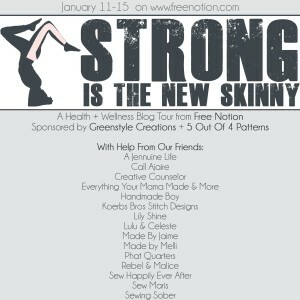 Welcome to the final day of the Strong Is The New Skinny Blog Tour Hosted By Free Notion. I’ve been reading along all week and the ladies have some fantastic stories and photos that I hope you have enjoyed as well. I’m stoked because I get to write about sewing, activewear, AND my favorite fitness activities. Whoa, this must be my birthday or something! I really am thrilled about joining the blog tour because it is a collision of my happy worlds. Get outside, simply because that is where I like to spend my time. That last part, “where I like to spend my time”, is the one I have found is key for me and that has changed over the years. I was always active, and whether in gymnastics, volleyball, bicycling, snow skiing, or waterskiing, I was always doing something. Even as a teenager I was excited for the day I was FINALLY old enough to join the fitness club with my mom. At that time, it was all about the aerobics and weightlifting, and I thoroughly enjoyed it. 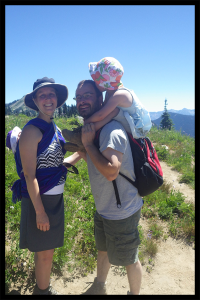 These days you won’t find me at the gym or on any type of court or even on my bicycle; but I can be frequently seen outdoors, hiking with my kids, the youngest on my back. I don’t look at it as fitness because it is simply what I like to do. There is it again, so in case you missed it, it is what I LIKE to do. There are a few things I would love to do more of, but right now it is more difficult with little children. Bicycling and paddleboarding come to mind, but due to logistics I can temporarily accept that those are not options for me for the time being. If you are looking to start exercising, try some new things and find what you enjoy. Try team sports or groups, try solo activities, find your niche and go with it! The more you enjoy it, the more likely you will do it. What works for me right now is hiking, swimming (indoors and outdoors), and practicing yoga. I started yoga many years ago when I was looking for an excuse to get out of my cubicle at lunch time. I was less than excited and honestly skeptical about it, but I told myself I would give it two months. I was one month in when I realized there was no turning back, the transformation was unbelievable. Yoga was able to help in unexpected ways, far beyond flexibility and peace of mind, although those are fabulous benefits too. Yoga assisted by body in strengthening and healing the physical imbalances and misalignments. A couple of years later I trained to become a certified yoga teacher. Did you know there is a level of yoga for nearly everyone? There is restorative, cardio and even chair yoga! Though I did not have children at the time, through my practice and training I learned how yoga is especially beneficial during pregnancy and I aimed my focus on prenatal yoga. I am not currently teaching but I do try to keep up my own practice, a difficult task when you don’t like to be used as a climbing gym by littles and would prefer at least a small fraction of mental calmness. 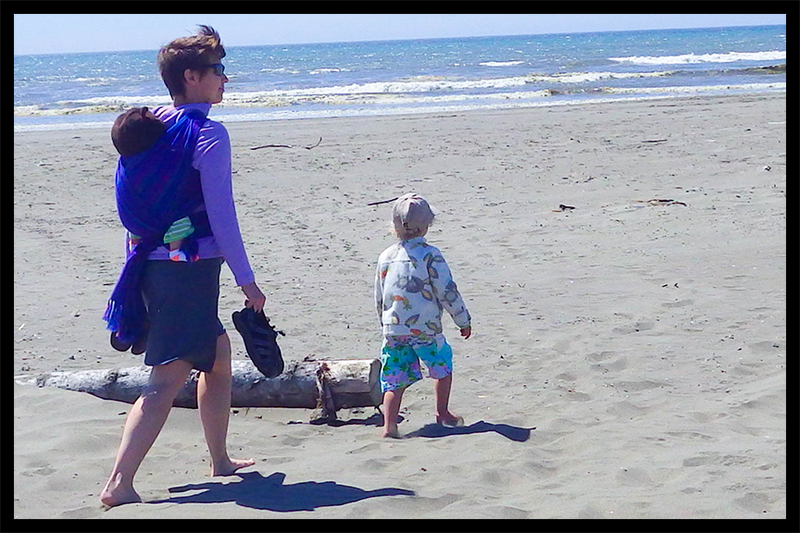 I recently returned to my beloved yoga class after many months off with the baby. I was so excited I literally walked out my front door and jumped for joy as I danced to my car. I smiled and hugged my teacher upon entering her studio, ah, back where I belong. It has been a long break and though it was for a good cause I was elated to be back. I practiced yoga while pregnant nearly up until the end. Practicing those last few weeks was difficult, awkward, and not pain-free. All throughout that first post-baby class, every move I made reminded me of those last few weeks of pregnant classes and it was bittersweet. Nursing also takes its toll on the body. Sure, I get to stare at that sweet beautiful baby up close several times a day but that means I’m hunched over and my neck, shoulders and back are taking the brunt of the work. I might be skinny, but my body does not feel great and that is what I long for. My food sensitivities have a devastating effect on my nervous system leaving me with migraines, tinnitus, foggy memory, and vertigo to name only a few. The list goes on and on but I will spare you the rest of the details. Thankfully, I have an amazing yoga teacher to literally help set me straight. Hold up!!! Today’s main topic of interest is the outdoors, why are we here talking about yoga? Do you remember how I said I love the outdoors? That goes for yoga too. The perfect place for my mat is out on the deck. Today it is a delightfully warm 35 degrees outside and SOGGY. If it wasn’t so wet it would be frozen, so today you get indoor yoga, while looking outdoors. Oh dear, does this mean I’m posing with trees? Kids frequently have their own idea of what mama’s yoga time should look like. My oldest has participated for a couple of years. She likes to grab my books, find a pose and have me guide her into it. Another fun way to involve kids it to let them make up their own pose and name it. It always results in a silly name but we both have fun that way. The baby’s idea of yoga time. Oh, look what I found! This photo was from 2008, two and a half YEARS into building this home with our own hands. 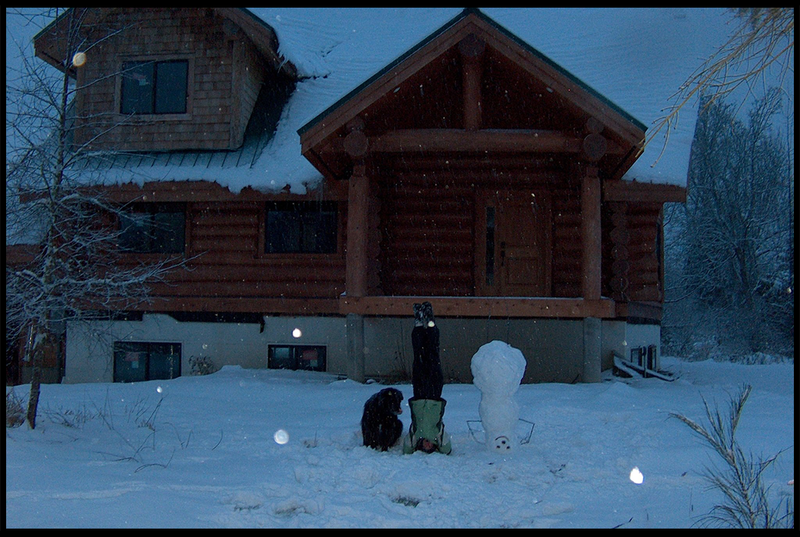 Everyone builds snow yogi doing a headstand and poses along with it, right? This, I want to do this again because I was strong back then. I popped up into this pose with ease. My back would suffer if I did this today. Hey wait, aren’t we supposed to be talking about sewing activewear here too? Right, let me get to that! Since a big part of my current life is nursing, nursing, and more nursing and my at-home yoga begins and ends with…nursing, I like to wear either a 5 Out Of 4 Patterns Agility or Versatility nursing tank. For everyday wear, I prefer cotton lycra but a moisture-wicking fabric (with lycra) would be perfect for working out if you are going to sweat. I wear one of these tanks daily, so why not make them fun! The stained glass fabric came from Knitorious Fabrics. Never would you be able to buy such a beautiful nursing tank! 5 Out Of 4 Patterns Versatility tank with nursing option. Swimming has been a lifelong activity for me and I am happily passing it on to my children. I love anything to do with the water whether swimming, paddle boarding and especially waterskiing. Since it is currently the middle of winter in my hemisphere of the world all I can do is go to the local indoor pool and splash around with my girls. Usually that means walking the pool with the baby or practicing swim skills with my 4 year old. That’s a lot more work than you might think. 😉 I also believe it is one of the best exercises you can do no matter what fitness level you are whether young, old, pregnant or postpartum. This is one activity that has always felt good to me. I love the feeling of weightlessness (especially while pregnant). In the summer, I have been known to disappear to the lake for days (or weeks) at a time. Summers are short, so I enjoy it while I can. What that means though is I need swimsuits, lots of them, and activewear I can nurse in is a fantastic bonus. 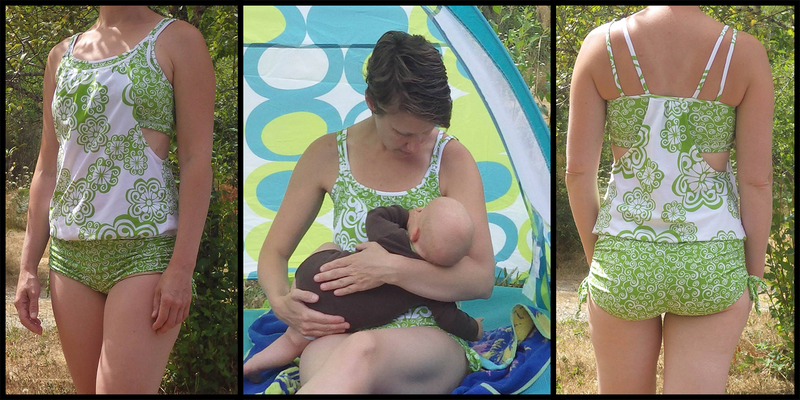 The 5 Out Of 4 Patterns Agility Tank was put to good use last summer when I made four nursing swimsuits, all completely different. With the options this pattern offers, I had everything from a bikini top (yes, a nursing bikini! ), to slim fit tankini, to our popular loose fit overlay version. I’ll admit, that overlay lets you feel like you can let it all hang out and that is a wonderful feeling when you are postpartum and self conscious. I made matching 5 Out Of 4 Patterns Riptide Ruched Shorties for three of the four swimsuits and I used the 5 Out Of 4 Patterns Adventure Skort for a swim skort. All of my fabric is nylon spandex swim knit and lined with nylon swimsuit lining. I found that Ebay has some great sellers, The Fabric Fairy carries some nice prints and a few custom fabric groups are starting to carry it as well. 5 Out Of 4 Patterns Agility Overlay Tankini with nursing option and Riptide Ruched Shorties. Agility A-line Nursing Tankini and Adventure Swim Skort. Hiking, I love it, that’s really all there is to that. I love being outside whether at the beach, in the mountains or anywhere in-between. My four year old also enjoys it and even now when we head outside all bundled up we can easily spend two hours looking around at what nature has to show us that day. She loves to “do nature” and I love teaching and learning right along with her. 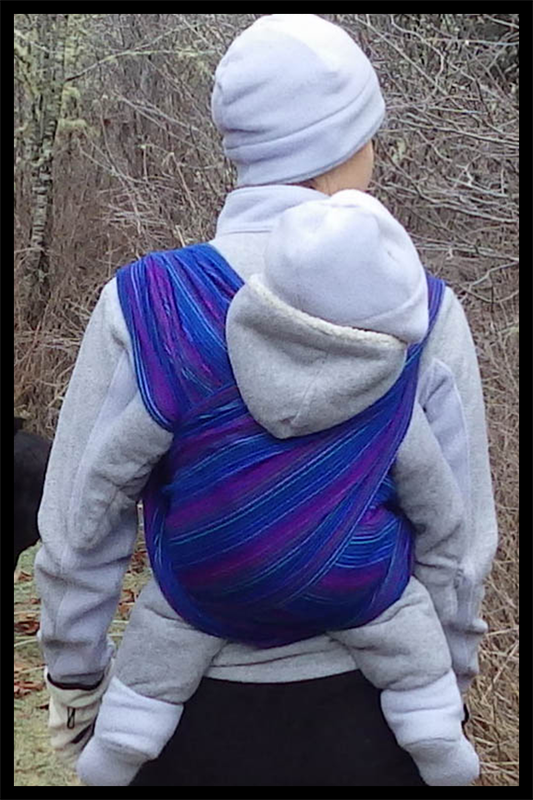 Plus, the baby can easily tag along. 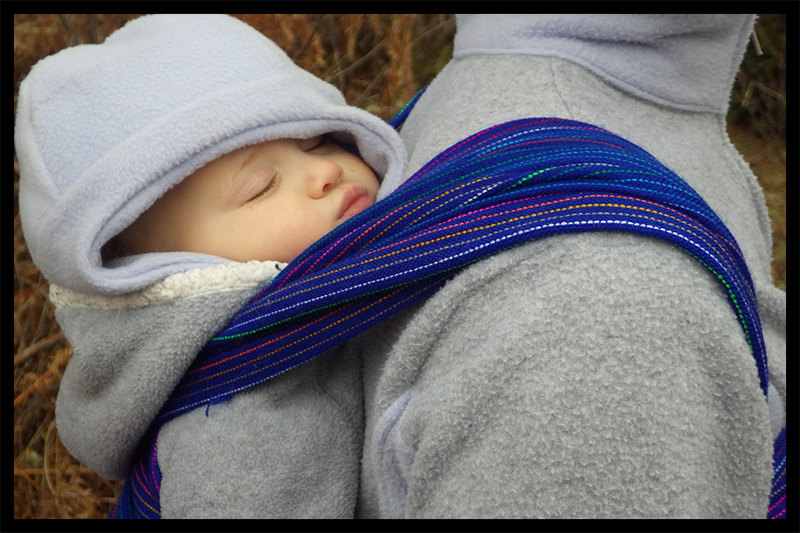 I wrap her on my back in a woven wrap and she can look and listen to everything we do and when she’s tired, she peacefully passes out. 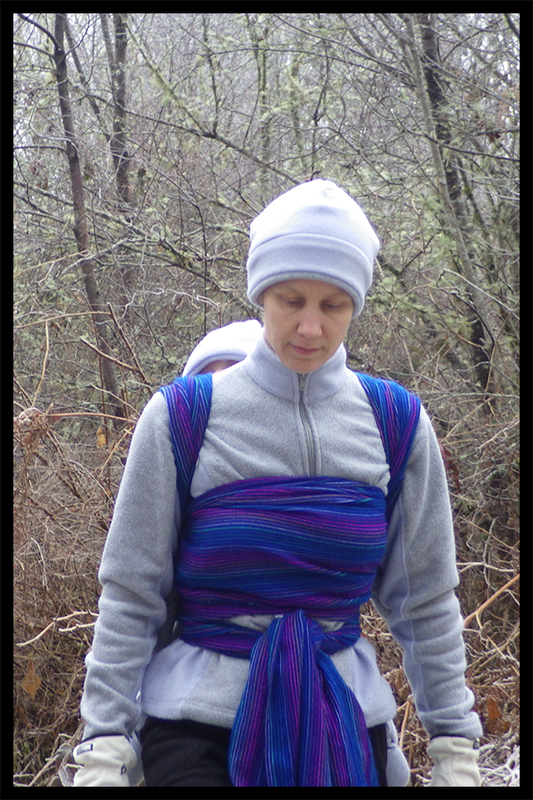 Babywearing takes practice and this was not a perfect wrap job. Winter layers add an additional challenge. 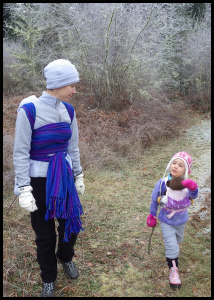 If you are interested in babywearing, contact your local chapter of Babywearing International. Many chapters can be found on Facebook as well. The double hammock carry is a comfortable carry for me. 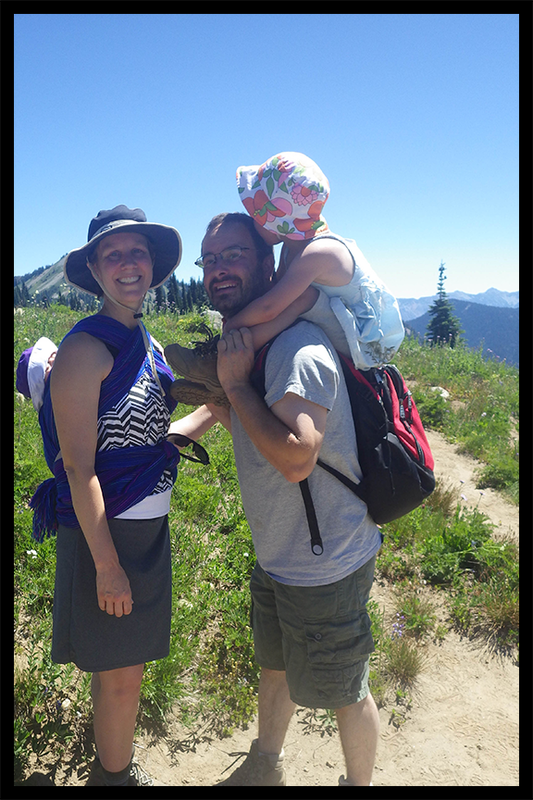 It distributes the weight well enough for long hikes. Napping on mama’s back during a hike. 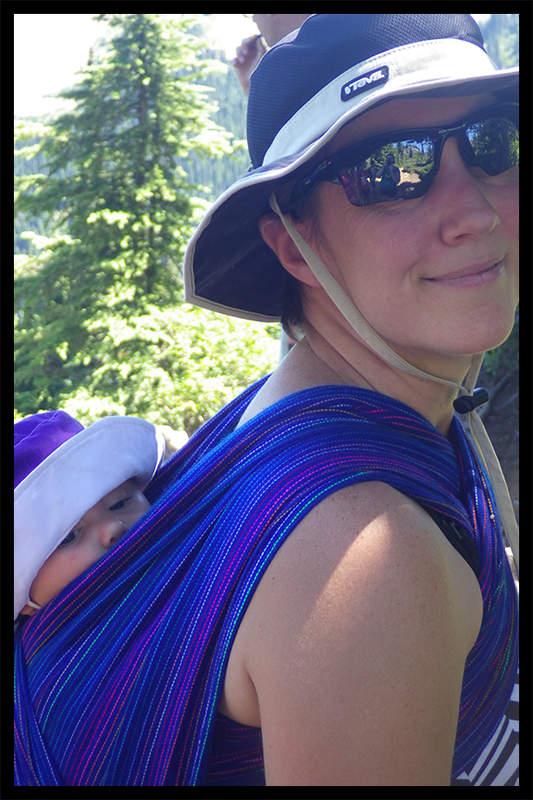 Baby wearing nearly always guarantees a nap. The longer I keep moving, the longer she naps. Practicing in the mirror helps. Funny faces are mandatory for entertaining the baby while standing still. Five minutes later she was out and I made dinner in peace. 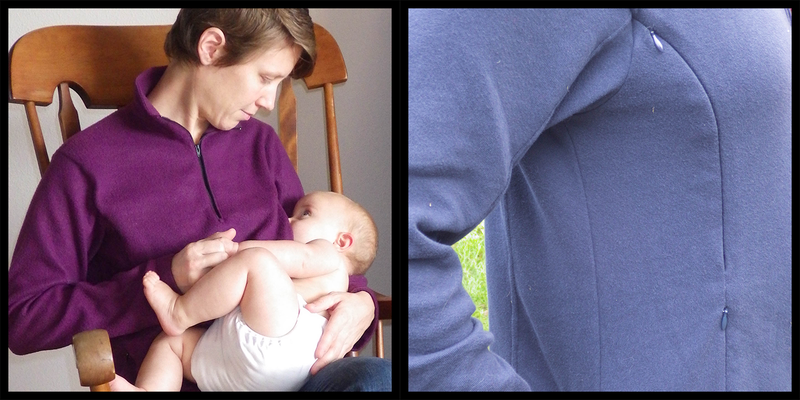 I love the 5 Out of 4 Patterns Ascent Fleece Pullover with invisible zippered nursing access and pockets. 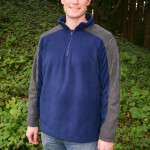 I have made it in microfleece, french terry, and this one from SpandexByYard’s 200 wt double sided fleece. I enjoy the warmth of this one, but I found that this “Anti-pill” fleece still pilled. I layer a nursing tank underneath made using the Versatility or Agility tank patterns. 5 Out Of 4 Patterns Women’s Ascent Fleece Pullover made from a heavier fleece keeps me warms during a winter hike. 5 Out Of 4 Patterns Ascent with invisible zipper nursing access. Stay warm! Feed the baby! Everyone wins! 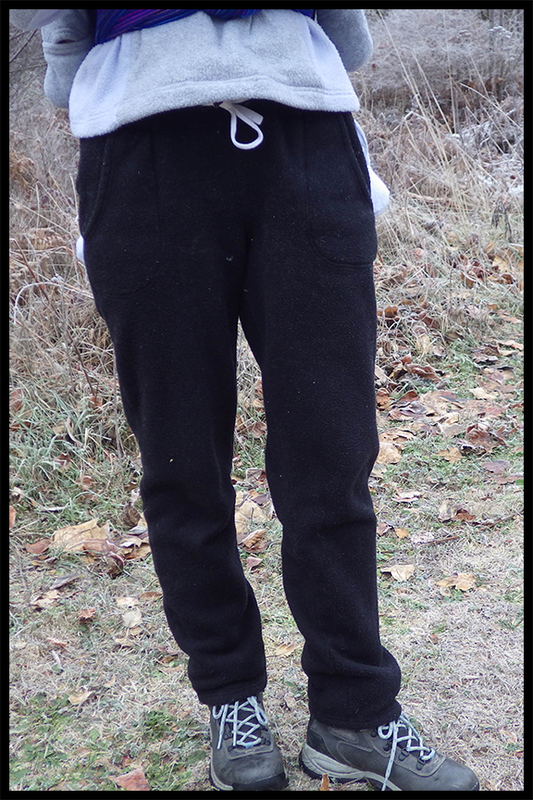 Greenstyle Brassie Joggers in heavy weight fleece. I <3 these pants to Pluto and back. 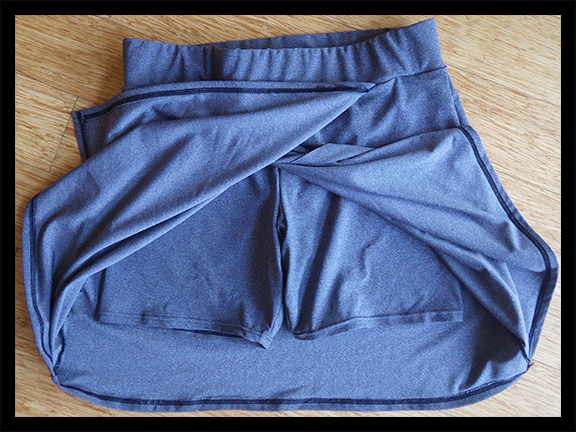 During the summer, the Agility nursing tank paired with a 5 Out Of 4 Patterns Adventure Skort was my goto activewear. 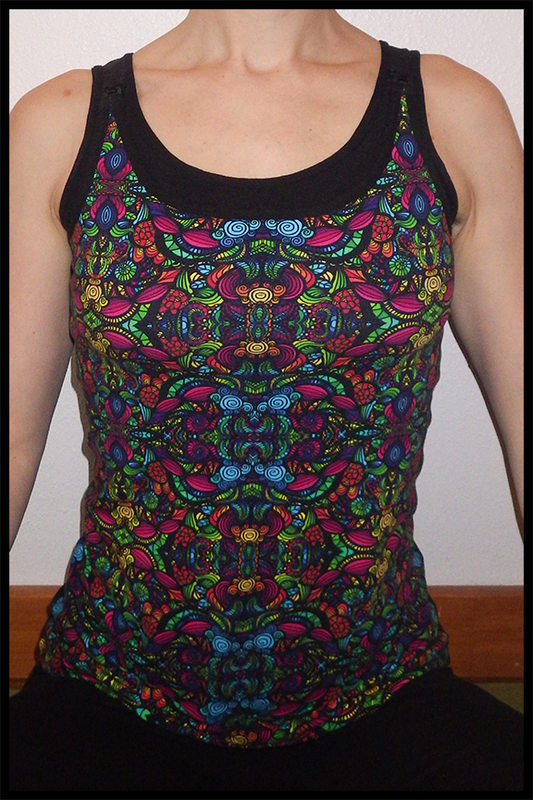 This tank I show below has a nylon spandex bra and cotton lycra overlay. If you know you’ll be sweating in your tank, you might find a non-cotton blend a better option for your overlay. The skort is polyester lycra and, as I found out, it also dries incredibly fast and sheds sand with ease! After hiking in the mountains we headed down to the river to dip our toes in the water to cool off and the water level was so unusually low and temperatures warm that we all ended up going for a swim. Both the tank and skort performed fantastically in the unexpected water adventure. No wardrobe malfunctions, even when soggy. 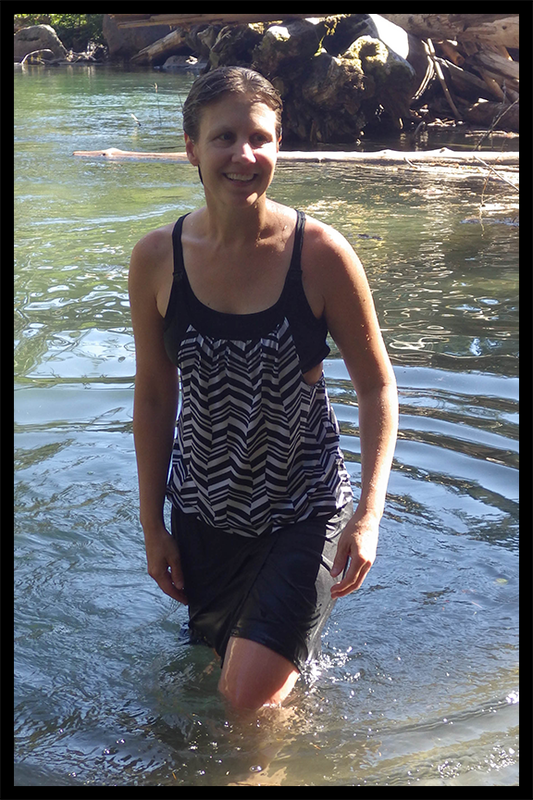 A hot hike called for a swim in the river on this 90 degree day. Perfect activewear – the Agility Tank and Adventure Skort perform well under pressure. All wrapped up and protected from the sun on this hot hike. 5 Out Of 4 Patterns Adventure Skort has a wrap-style skirt. The 5 Out Of 4 Patterns Adventure Skort when made in poly lycra sheds sand and dries quickly. A tip I have for many of the 5 Out Of 4 Patterns is to use Washaway Wonder Tape*. 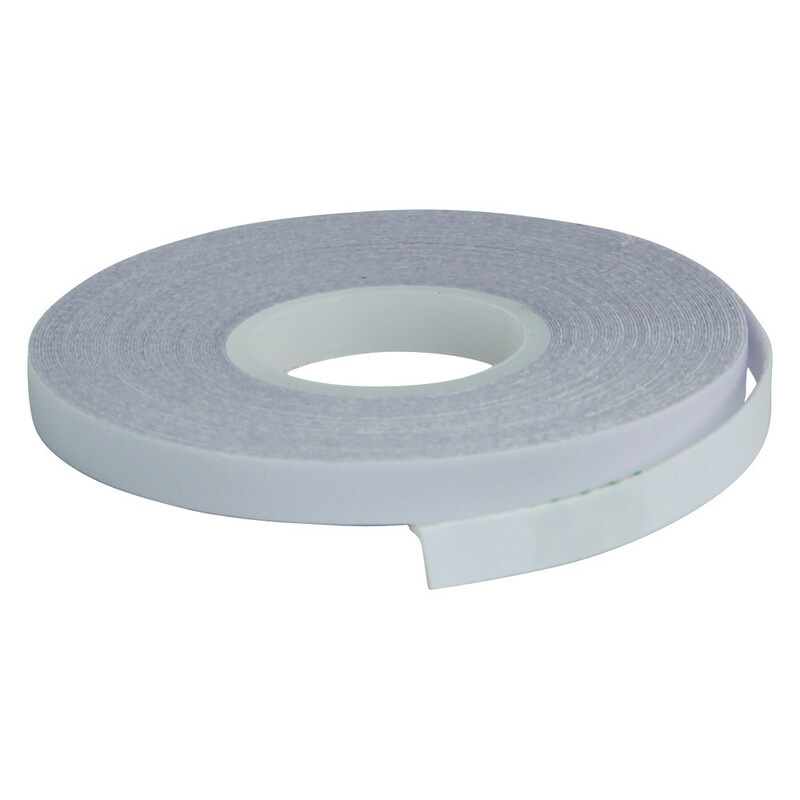 It is a thin, double sided, 1/4″ tape that will help you keep things just where you want them. It is fantastic for binding on tanks, especially the Agility Tank, and also great for the collar on the Ascent Fleece Pullover and waistband of the Reversible Riptide Shorties. I recommend grabbing a few rolls as I use it all the time including when I embroider badges for our homeschool scout group, plus I hear it is great for quilting too. 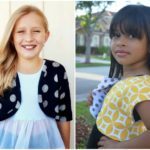 This week happens to be the 1 year anniversary of 5 Out of 4 Patterns and we are having a SALE! 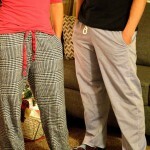 Use code FLEECEFORALL to get 30% off at www.5outof4.com through January 17th. If you have questions about sewing up your 5 Out Of 4 fitness wear or want to show off what you’ve made (we LOVE it when people do this), join us in our 5 Out Of 4 Patterns Group Facebook group. Our patterns for activewear don’t end here! There’s a new racerback tank in testing right now. Watch for the release next week! Be sure to check out the other blog participants and read about their amazing fitness journeys with everything from running, to ballet, strength training and more, plus a little bit of sewing too. 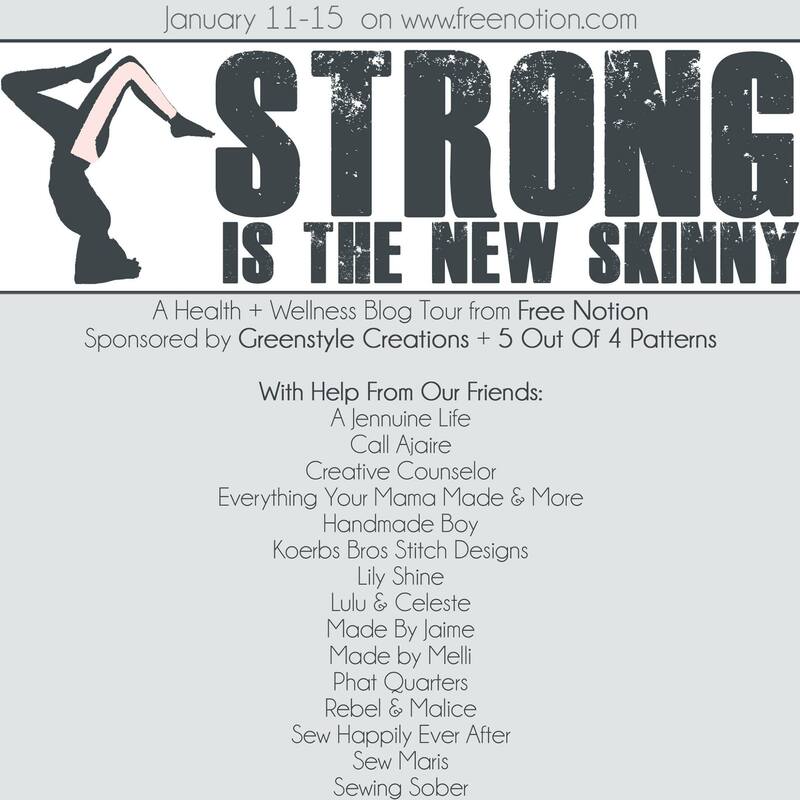 Thank you to Becca from Free Notion for including me in your Strong Is the New Skinny blog tour. It was a pleasure both sponsoring and participating in the tour! *This post contains affiliate links. Thanks for supporting 5 out of 4! Wow! You are awesome! I always wanted to become a yoga teacher specifically in prenatal yoga because it was lifechanging for me. However, trying to do that stuff with 5 kids is quite an obstacle to overcome. I love seeing all the ways that everyone is staying active and dealing with their thoughts on their body and strength. Such great inspiration! Thank you! I really loved seeing how you’ve created a handmade wardrobe for your active life. I am just getting into sewing Activewear and enjoy being able to customize to my needs. Thanks for the inspiration!